Tracker Upload Manager manages the incoming asbestos survey data from asbestos surveyors when sending data to Tracker or Alpha Tracker from Tracker Mobile. v1.0.79 of Tracker Upload Manager is now available with some performance improvements and changes enabling customers to work with up to 1,000,000 asbestos survey and asbestos reinspection projects. Please contact the office to obtain this release. Most of our asbestos consultancy and asbestos surveyor clients use Tracker or Alpha Tracker to improve their asbestos surveying and asbestos removal operations. Most asbestos consultancies also offer other environmental services - did you know that Tracker and Alpha Tracker can also be used to capture data on site and produce reports for all of these services? You will be able to use your existing Android or Apple smartphones or tablets to capture data and photographs on site and then transmit this directly into your server ready for report production. Please contact Elaine if you would like to discuss any of these additional services on 0845 612 2402. Micad is the leading provider of web based Property Management and Compliance software in the UK. Many asbestos consultancies running Tracker or Asbestos Tracker need to send their data to Micad users and this has always been a manual (re-typing) task - until now. I'm delighted to announce that Micad and Start Software have agreed to jointly develop software enabling the products to be linked so that data can be exchanged between them and this will be of huge benefit to our mutual clients. For more information, contact Robin Bennett at Start Software or Peter Harris at Micad. I blogged back in May (see http://robinbennett.blogspot.co.uk/2013/05/tracker-user-reaches-milestone-100000.html) about our first asbestos consultancy customer reaching the 100,000 project landmark - that's a lot of asbestos reports produced using Tracker technology! 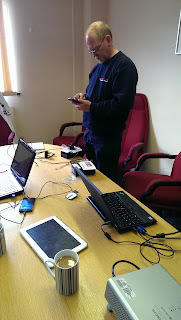 The next asbestos consultancy has reached the same milestone with 100,000 asbestos reports produced using the Tracker product family - Tracker Mobile for the surveyors' asbestos data capture, Tracker Document Maker for the asbestos survey report production, and Tracker Web Server securely publishing the asbestos reports over the Internet for the customer to read. 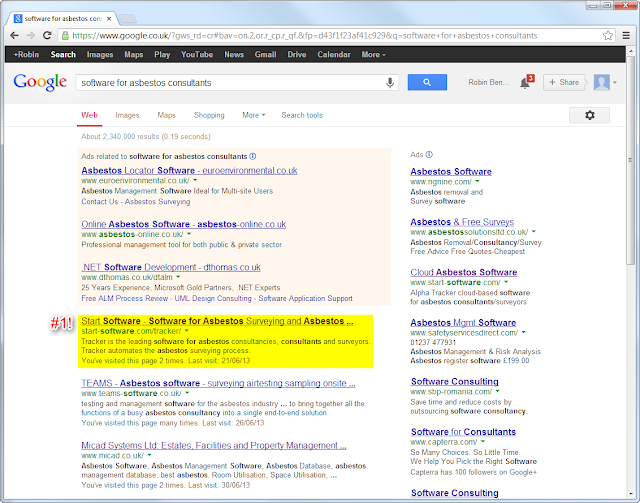 Start Software's "Tracker" asbestos system is #1 on Google! I've spent the last few months working on our search ranking on Google. Although Alpha Tracker and Tracker are the UK's leading software systems for asbestos consultants, surveyors and consultancies we were off the first page on Google searches. Very annoying! There are various tricks and short-cuts to move up the search rankings, but none work long-term. You can pay to get your website listed (these are the ones shown at the top of the screen below) but I don't believe in spending money when some hard work will have the same effect! So I have been applying some elbow grease, working hard to improve the quality of the information available on our web site and linked to it. 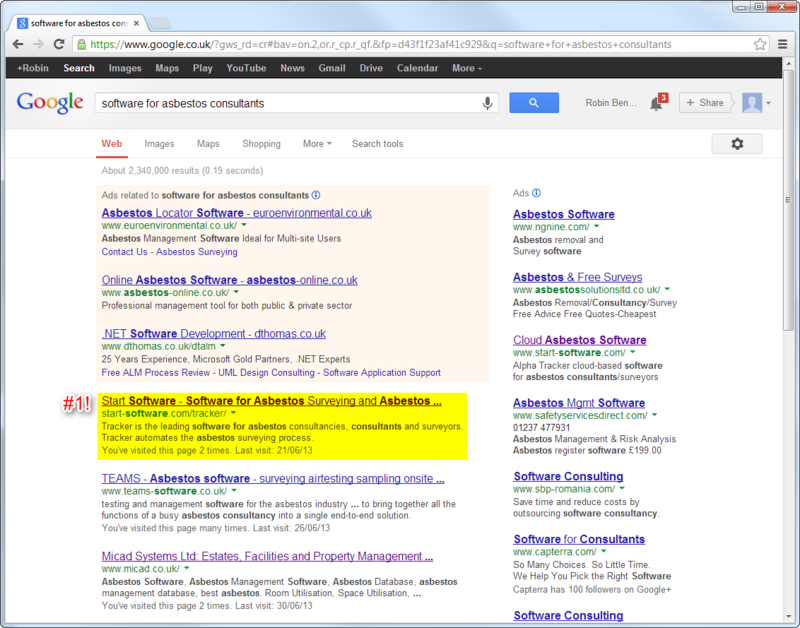 Having seen gradual improvements over recent weeks, we have now achieved the perfect result - #1 on Google! I'm happy to share my tips with you if you want to improve your ranking - drop me a line or give me a call on 0845 612 2402. 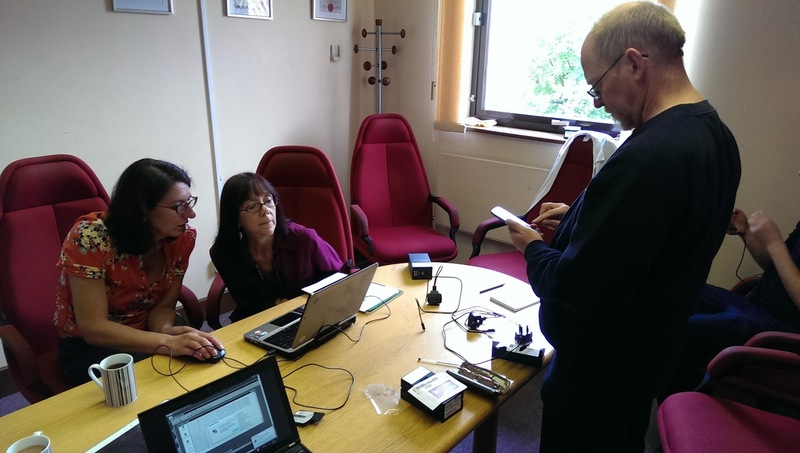 Birmingham City Labs are one of the UK's oldest and best established asbestos surveying and testing laboratories, and this week we've had the pleasure of training their asbestos surveyors and admin staff in the use of Alpha Tracker and Tracker Mobile. 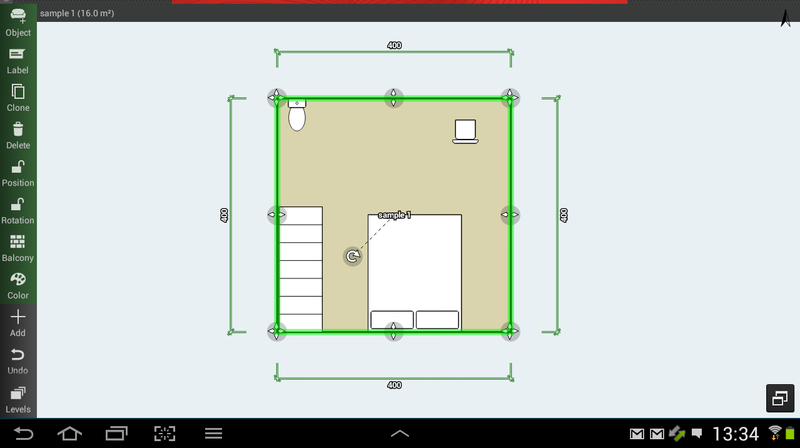 Do you want to draw your floor plan at the same time as recording the asbestos survey and sample data using Tracker Mobile? 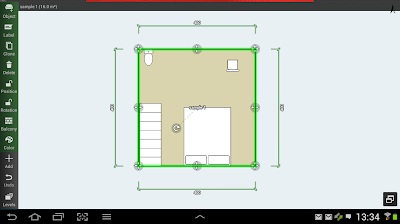 Search the Play Store (on Android devices) or the very similar "FloorPlans" on the App Store (on iPad and iPhones) and you can be using these apps in minutes. 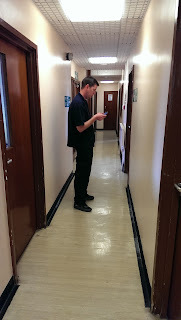 Both of these packages (and the others available - we can work with any of the floor plan packages available on smartphone and tablet units) are fully compatible with Tracker, Alpha Tracker and Tracker Mobile giving your surveyors the widest possible options when creating and modifying floor plans whilst asbestos surveying. We've just had our busiest support month ever. Felt like it too! 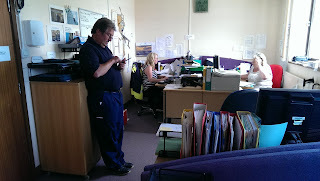 More than 300 calls for assistance were logged and resolved by the Start Software support team. Amazingly, we managed to solve 93% within the time-scales set by our customers. That's not a bad result at all.